Obituary – Avery, Barbara Jean « Perry High School Alumni Association, Inc.
﻿Freshman Play 49-50, Red Hots 50-51, Sophomore Assembly 50-51, Library Staff 50-52, F. T. A. 51-52, Junior Assembly 51-52, D. E. 51-52, Annual Staff 52-53, Annual Play 52-53. Barbara Jean Avery, age 83, a native of Lucien, OK, passed away Friday, March 22, 2019 in Midwest City, Oklahoma. Visitation will be 9:00 AM to 8:00 PM Friday, March 29, 2019 at Dighton-Marler Funeral Home of Perry. Family will greet guests from 6:00PM to 8:00PM. A Celebration of Barbara’s life will be Saturday, March 30, 2019 at 10:00AM at the Lucien United Methodist Church in Lucien, Oklahoma. Pastor April Coates will officiate. Interment will immediately follow at McGuire Cemetery. Memorial contributions may be sent to Cherokee Strip Museum in c/o Dighton-Marler Funeral Home, P.O. Box 189, Perry, Ok., 73077. Barbara was born July 18, 1935 in Lucien, Oklahoma to Estel and Olive (Cristman) Avery. 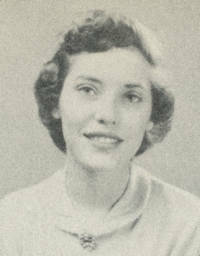 She grew up in the Lucien/Perry area and graduated Perry High School in 1953. After high school she earned her associate degree at Mesa State College in Grand Junction, Colorado. She worked as a Legal Secretary for a while, and then in sales for several years. She was also a Certified Master Gardener. Barbara also enjoyed spending time in both Colorado and Utah. Some of her hobbies included arts & crafts, knitting, and spending time researching Oklahoma history. She was very proud of her Oklahoma heritage. The Mills-Cristman Farm that she was raised on dates back to the 1893 Oklahoma Land Run and is still a part of the Avery family. Family was always very dear to Barbara. She loved spending time with her precious granddaughter Alexis. Survivors include her son, Doug Ozment of Oklahoma City, Oklahoma; granddaughter, Alexis Ozment of Oklahoma City, Oklahoma; five brothers, James Avery and wife Pat of Grand Junction, Colorado, Roger Avery and wife Ruth of Edmond, Oklahoma, Mark Avery of Phoenix, Arizona, Paul Avery of Perry, Oklahoma, and Steve Avery of Covington, Oklahoma; three sisters, Peggy Hilliard of Sallisaw, Oklahoma, Cindy Avery of Moab, Utah, and Lisa Avery of Phoenix, Arizona; numerous nieces and nephews, and a host of friends.